I'll admit, after growing up reading Janette Oke's prairie romances, I didn't think a fresh perspective on those tales existed. I am delighted to report I was wrong. Waiting for Summer's Return, Kim Sawyer's debut novel, shook my preconceptions. From the first page of this delightful book, I journeyed back to 1894 and the windswept plains of Kansas. Sawyer does a fantastic job making the era and characters spring to life. The stuggles of the characters engrossed me, and I delighted as triumphs peeked through the trials. With each sentence she paints a vivid picture of this unique German setting and places you deep inside the minds of the main characters. It is easy to fall in love with the gentle giant Peter Ollenburger. And I grew with Summer through each test and victory. If you thought there wasn't a fresh twist on the prairie romance, think again. And if you love Janette Oke's books, you will be delighted with Waiting for Summer's Return. 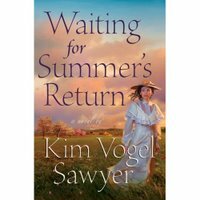 Nice blog and I'll have to add Summer's Return to my reading list. Having "cut my teeth", so to speak, on Janette Oke, I'll have to add this to my TBR list. I'm itching to read this book! Glad you've joined the blogging trend! Great review! Thanks, Cara! And welcome to the blogosphere! Want to trade links? E-mail me!